If your internet connection is too slow for this page, please call in your order or send us an email with what you want. Here are all the details for the next print that is ready to be added to your shopping cart. As you select options, your choices will instantly show here for you to check before adding to the cart. The price shown here is for your first print of this image. The prices for the second through fourth print of this image are 10% less than the first one, fifth through ninth are 15% less, and the tenth and over are 20% less. Change quantity on the shopping cart page. The discounted price subtotal will show there. On this page you will specify options for your print, summarized on the right, then add to your shopping cart. Your first time? We recommend reading info under the help buttons. There are lots of options but lots of help choosing them and note that the defaults have been set to the most popular choices. When you checkout, you will have the option to ship one order to multiple addresses. If you want us to blind drop ship any prints, be sure to choose that option under "Special requests" below. If you upload an image a second time, it will be renamed. Upload your image files ? Leave in RGB mode; do not convert to CMYK or Grayscale. We prefer that you do not upsize and sharpen. This is a free service we provide. When browsing use Ctrl-click, Shift-click, or Ctrl-A to select multiple files. If you upload an image file a second time without changing the filename, it will be renamed. See Your images menu box on left for more information on preparing your images. If you need to make changes after completing your order, upload again and send us an email to be sure we use the right file. If you have files over 150 MB, first upload small jpegs (best if they are about 800x800 pixels) using this upload tool for your order thumbnails, then click on "Upload big files" in the "Your images" box on the left. Browse for up to 25 image files at a time, up to 150 MB total, then upload. Your files over 150 MB? Files should be jpg or tif, sRGB or Adobe RGB color space, 8-bits. More info here. Do not close your browser window or click on any links until done. Upload extras for our advice on which will print best. Click on file name below thumb in upload box for more info on the file. These are used for your gallery on this site and for your Certificate of Authenticity. They will not appear on the print. Captions will help you identify the image on the receipt and when reviewing past orders. When you click on any of the select, delete, rotate, or save buttons, captions for all images will be saved to your account. The date is when you last uploaded the image. Your account has no images yet. If you send your image by email, FTP, or Dropbox, then you should upload a small jpeg here. However, it is not a problem to place an order without an image as long as you get the image to us somehow and let us know what image(s) to use for this order. Since you are not logged in, your images will be stored in a temporary location. When you log in, they will be moved to your personal storage area so they will always be available. Prints on Canvas or SmoothPhotoCloth wrap around the sides of a box made of super-strong MightyCore panel. Click info page button to see comparison with canvas stretched on wood. A UV and water resistant coating is applied to the front and sides. Prints on fine art paper, canvas, eSatin photo paper, or metallic photo paper are dry-mounted to the front of a box made of a super-strong MightyCore panel. The sides are acid-free black or white paper (or we can spray-paint them any color). A UV and water resistant coating is applied to front and sides. Prints on your choice of media wrap around the sides of a box made of super-strong MightyCore panel which floats inside a metal frame. There is a wide selection of frame colors. 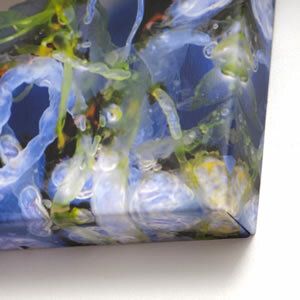 A UV and water resistant coating is applied to the front and sides of the print. Prints on fine art paper, canvas, or any of our print media are dry-mounted to sturdy 1/4" acid-free MightyCore board which is suspended out from the wall by a hidden black MightyCore box. Wrap option available for all print media. A UV and water resistant coating is applied to front. Prints on fine art paper, canvas, or any of our print media are dry-mounted to extra heavy-duty MightyCore board. These are guaranteed not to warp; no frame is required. We can optionally wrap any of our print media around the sides for a mini-gallery wrap look. A UV and water resistant coating is applied. Hanging options include hook-loop "coins" for attachment to a wall. You can also insert this into a frame that you purchase locally. Giclee prints on archival matte paper or e-satin photo paper. No coating is applied. Minimum order 10 cards. Best to size for provided envelopes: 3.5x5, 4x6, or 5x7 inches. You will mount your print to the front of a box made of a super-strong MightyCore panel. The sides are acid-free black or white paper. 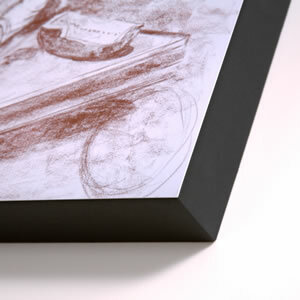 We recommend this mounting only for very large prints to save shipping cost. Prints on Canvas or SmoothPhotoCloth wrap around a wood stretcher frame. Kit arrives rolled and easy assembly takes about 30 minutes. A UV and water resistant coating is applied to front and sides. Giclee prints on fine art paper, canvas, SmoothPhotoCloth, or e-satin photo paper. An optional UV and water resistant coating is applied. Small ones ship flat; large ones rolled and inserted into a sturdy mailing tube. Choose a print medium for your ? This is a fine art all-cotton archival paper with a vellum surface (lightly textured). We apply an optional waterproof coating that can be matte or gloss. This is a fine art all-cotton archival paper with a smooth surface. We apply an optional waterproof coating that can be matte or gloss. This eSatin photo paper shows less reflections and fingerprints than gloss or matalic paper but still has deep blacks and bright colors. It is less expensive than other papers but is less durable. We apply an optional thin lacquer coating. This paper has a silver tone and very high gloss so photos look like they are printed on metal. The metal look is mainly in the whites and color reduces the affect so this paper is especially well suited to black and white images. We apply an optional thin lacquer coating that reduces the metallic look somewhat but also reduces the visibility of finger prints and allows cleaning with a damp cloth. 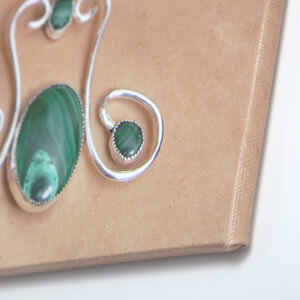 Canvas has a coarser texture and is more durable than our paper choices. When photos are printed on canvas you may lose some detail when viewed up close, but when you stand back, the texture provides a wonderful painting-like quality to the photograph. We use Lyve Canvas, an archival cotton/polyester artist canvas made especially for the giclée printing process provided by Breathing Color. We apply a waterproof coating that can be matte or gloss. When you make your own print or purchase a print elsewhere, we can mount it for you. If you have the digital image, it is better if we print on our quality print media. It is possible that your print will not be compatible with our hot dry-mount press or our coatings, so please provide a scrap or let us trim the print for material for us to test. We limit our liability to $100 if we destroy your print while trying to mount it (see our Terms and Conditions), so don't send an expensive original print or one with sentimental value. We can make reproductions of your original art as a safe alternative. Our SmoothPhotoCloth™ is a thin synthetic fabric with a fine weave and a bright white ink receptive coating. This fabric gives you vivid, sharp prints with brilliant colors. This is a great alternative to Canvas for Gallery wraps and also works well with all of our other mountings except Box mount. We highly recommend this for any of our wrap mountings. We apply a heavy waterproof coating that can be matte or gloss. Our WallPeel™ is a thin synthetic fabric with an adhesive on the back and a fine weave and a bright white ink receptive coating. This fabric gives you vivid, sharp prints with brilliant colors. It is easily applied to the wall or to your car, and is easily removed and relocated without damaging the surface. We apply an optional heavy waterproof coating that can be matte or gloss. This is a wood fiber paper similar to but less expensive than Optica One. It is ideal for greeting cards. You will mount your own print on the box we provide. Any paper or cloth should work. Do you want a protective coating applied? 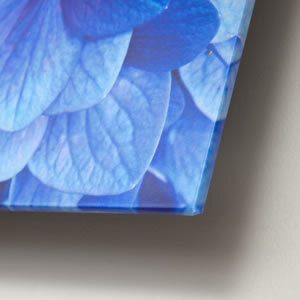 We recommend our protective coatings if you plan to display without glass. We can apply Glamour II Veneer (matte or gloss) to any media except the Luster and Metallic photo papers, and we will apply Premier Art Print Shield to the photo papers or others on request. Glamour II is a water-based veneer that is sprayed onto canvas, SmoothPhotoCloth, or fine art paper. The matte Glamour II prepares the surface with no reflections and the Gloss shows some reflections/glare but not as much as Luster paper or glass on framed prints. If you can avoid reflections, we recommend gloss coating which results in darker blacks and brighter colors. Questions? Contact us. If you are not sure what coating and paper you want, request our free sample pack before placing your order. You do not need to crop (cut off part of your image) to fit our mounts and frames since we print any size. However, you may want to crop for asthetic reasons, to fit a standard pre-made frame, to fit a space on your wall, or to match prints you already have. Do you want us to crop your image? If you have cropped your image before uploading or if you like the original composition, then you should select "no". In this case when you choose one dimension, the other will be chosen for you. If you want us to crop, you can choose any size and any aspect ratio (square or rectangular) and we will crop according to your instructions (enter in special instructions box, Special tab) or if you don't specify we will use our judgement. In any case we will ask for your approval before printing. Should Redipix crop image to fit? Yes, unless crop not needed to fit selected size. No, so one dimension below will be chosen for you so the image will fit. Crop to fit Will force a fit to your size chosen here: ? Choose the print size for your ? Choose a standard size or enter your custom size in the drop-down boxes below. When the print is framed, the print size does not include the frame. When the print is wrapped, the dimensions given are the face size, the size you see from the front. One of the dimensions for the print will be chosen to fit the image. If you sent us your image by other means, you still need to upload a small version here to get the correct size. Use the "Crop to fit" button to force the size you select below. Choose the width of a white border or 0.00 for borderless. If you want a printed border, choose 0.00 here and describe what you want in the special instructions box. White border width: 0.00 inch 0.25 inch 0.50 inch 0.75 inch 1.00 inch 1.25 inch 1.50 inch 1.75 inch 2.00 inch 2.25 inch 2.50 inch 2.75 inch 3.00 inch 3.25 inch 3.50 inch 3.75 inch 4.00 inch 4.25 inch 4.50 inch 4.75 inch 5.00 inch ? Be sure to tell us in the special instruction box what you plan to do with your unmounted print so we can check that your ordered what you need. 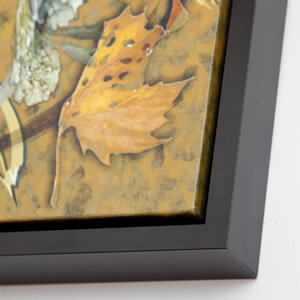 If you plan to hang your print behind a mat window, you will probably want us to leave a white border around the image. If you need a print to exactly fit your window or mounting, you should order a little larger (1/8" or 1/4") with a white border to allow bleed space so you can trim to the exact size later. A white border will help separate your image from the surroundings. You can also request printed borders in the special instructions box. If you want a printed border, leave this value at 0.00 since the border will be included as part of the print. Describe any special border you want in the special instructions box. This is the distance the mounted print stands out from the wall. Deeper mountings are better for both looks and strength. See table for minimum recommended depths. For Box Mount prints the paper surface of the board will show on the sides. For Flat Mount and Floating mount the core edge of the board will show. Both the black and white are 3/16 inch thick and are acid free so your prints will last a long time. Most choose the black board. 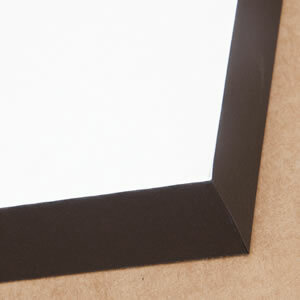 We recommend 21 Matte Black frames which is the only color we stock. If you want one of the other colors, note that the price will be higher and your order will be delayed by about a week. We stock these three hardwoods. The plastic bar can be white, beige, or black. In each case it is matte not glossy and the hole in the end will have a black plug. We recommend white since it looks good with most prints and is more durable since the black is painted onto the original white bars. The bars can be located on the top and bottom or on the left and right sides. When you make this choice it doesn't matter whether the image orientation is portrait or landscape. However, if the image is very tall or very wide, we recommend placing the bars on the short sides. As the examples show on the ArtRoll page, the bars can be cut at the edge of the print or they can extend out up to 2 inches. The hook-loop coins use an adhesive to attach to the wall (warning, this might damage paint when removed). With the three removable blocks option the print will hang on a nail, and the blocks can be removed for framing or attaching the print flat to the wall. The hanging wire & strips will allow you to hang on a hook and nail (with this option the print will sit out from the wall about 1 inch on some spacers we attach). If you plan to set your print into a ready-made frame, we will not provide a hanging wire unless requested in the special instructions box. With a stand-back you can stand your print on a table. If you have other ideas, please enter in the special instructions box. You can see photos of some of these options on the Flat mount page. For all print media including fine art paper with a heavy coating we can wrap the print around the sides of the MightyCore board. We can also put a foam layer between the print and the board. With the wrap option we can do image wrap or mirror wrap for the sides. For reprints you will receive a discount if you enter the original print number here. The print number is hand-written on the back of the print, it is on the Certificate of Authenticity, and it is next to the item number on your receipt. If you do not have the print number, please contact us. You also need to select the correct image from those stored in your account. If a reprint, enter original print number from the back of the print for a discount. Make sure your image is selected on the image tab, or if it is not there, upload a small version. We will print with your image that we have on file (so you can't get the reprint discount if there are any changes). We will edit your images according to your requests for no additional charge. Choose how you want the sides of the mounted print to look. Be sure to check out our 8 example options for the sides on the Gallery Wrap Elite page. For image wrap your image will be cropped as viewed from the front. You may not like this if your main subject is partly on the sides of the print. Also it reduces the resolution for what is left on the front. So usually we recommend a mirror image of the outer part of the image to go on the sides. If mirror wrap puts something you don't want on the sides, we can usually remove it. Another good option is to make the sides black or a solid color -- in this case we can extend the color to the front for a framed-look. If you think your image does not work well with Gallery wrap or if you don't want to pay for ink and paper on the sides, try our popular Box mount or Floating mount wrap. We can add a border to the image so it will appear on the print. We offer many different image border treatments at no extra cost. Be sure to enter the width and any other special instructions in the box below. The image will go right to the edge of the print. A white border of the width specified. A white border equal or larger than the width specified. The Vignette can be black or white (specify in special instructions box below). The mat can be a solid color or or it can have texture. The color can be taken from the image. Have an idea? Please request in the box below. If you want black and white or sepia, it is best to submit to us a full color image since this will give us the most control over the conversion. We can bring out (saturate) color that you didn't think existed in the image. Please describe what you are looking for in the box below or in an email. We will normally perform image corrections such as red-eye, remove blemishes, remove dust spots, and remove distracting background objects (see link in box for a complete list). Let us know if there is a particular edit you want, or if you don't want us to make some or any corrections. Unless you request otherwise, we will always adjust the brightness and contrast to look good on the printer we are using, trying always to show some detail in highlight and shadow areas. How should we build your product and edit your image? What else do you want that was not covered on this form? You can fill this box separately for each print. We can ship this print to your client without any of our branding on the inside or outside of the box. The return address on the address label on the box will be yours. If you mail or email to us your packing list or gift card, we will enclose it for you. This service is not available when shipping to your address, but you can remove any branding information before presenting to a client. When shipping outside the United States, we are required to provide a Commercial Invoice that must include our company name and phone number, but not our website address. Our Photoshop expert will use color managed printing to make the best prints for you. We provide free printed proofs for your approval to make sure we get it right. The free CoA (see example) is an information sheet with data on the print and image, warranty, and care information. Future owners can use it to help authenticate the print. This is a good repository of information about the print and some states require one if you sell the print. The CoA is printed with pigment ink on bond paper and, except for small prints, is placed in a plastic pocket on the back. We provide one copy with all information for you and one for your customer with only the information you select here. More info here. Include our Redipix.com brand name on CoA? If you plan to resell, you may not want our brand name on the CoA so owners contact you if there are problems. But note that your state laws may require the printing lab be available to the buyer, and the buyer may find value in knowing that a reputable printer was used. The branding sticker we place on the back of the prints is removable without damaging the print. Printing lab. This print, mounting, and Certificate of Authenticity were made by Redipix.com in West Lafayette, IN who is responsible for the warranty and can be reached on the internet or by phone. This print was part of order number 3512 that was placed on 02-Aug-2010. If you number your prints as part of a limited edition, you will want to include this information on your CoA. Enter the print number for this print and total number of prints you plan to have in your edition. If you are ordering more than one print of this image, enter the print number for the first one in this order. Limited edition. The artist represents that this is number 3 of an edition that is limited to 50 prints. There are no artist proofs and no full-size printer proofs. No other editions are in print. The buyer of this artwork is assured that the artist will adhere to this standard and that the printmaker will act according to the artist's direction. Include the camera EXIF data? Data such as exposure time and F-stop will be printed on the CoA if available. Select "No" if you do not want this data printed. Camera data. This image was captured on 05-Jul-2010 using a Canon EOS 5D Mark II. The ISO speed was set to 200, the exposure time was 1/125 s, the aperture was set to f/10.0, the flash did not fire, and the lens focal length was 47 mm. These will help you or a new owner when it is time to hang the print. Hanging instructions. Hold the picture up to the wall where you want it (usually centered about 60 inches from the floor). Mark the wall in the upper right corner with a tiny pencil dot. On the print, measure down and over to the center of the stretched hanging wire. Measure the same distance on the wall from your little dot. Hang with the nail and hook provided, or better purchase Command Sawtooth Picture Hanger hooks at your drug or homeowner store (these won't damage wall). To keep print from moving, place enclosed glue dots on corners, then press the print to the wall while pulling down on the hanger wire and holding level. Glue dots will probably not damage paint when removed from the wall after a long time. Include instructions on care of print? The CoA is a good place to put extra information such as this for later reference. Care instructions. Don't touch the print surface with your fingers or a hard object. Start by dusting with a clean dry cotton cloth or clean soft brush. After dusting, wipe the print with a clean damp soft cotton cloth. Don't use soap or a cleaning agent. If you sell a print without our Redipix.com branding, the owner of the print will have to work through you for warranty repair or replacement. We will continue to honor the warranty if you contact us, but you might want to replace our warranty with your own version for your customer. Warranty. This print and mounting are made of high quality materials and should last many generations if not displayed in direct sunlight. If the print fades, changes color, shows defects in mounting, or is damaged in shipment, please request a free replacement. If it gets damaged after arrival, we will replace it, charging you only half our current price. We will keep the digital file unless you request otherwise. A CoA should have copyright information and your signature. We will print your postal address, email, and phone number that you provide on the Billing information page during checkout. If you want different information here, we suggest not including this and apply your own sticker to the back of the print. Stick pocket for CoA on the back of print? We supply a free plastic pocket to hold the CoA (or any document up to a half sheet of paper). We can stick it to the back of the mounted print (except not for ArtRoll, Stretch-roll, unmounted, and small prints). This conveniently keeps the CoA with the print. Note that once stuck, the pocket may damage the back of the mounting board if removed. Unless you see a notification above, we are currently (18 Apr 2019) shipping 2-4 business days after orders are complete and any previews/proofs are approved. Large orders may take longer. During checkout you will have an opportunity to enter a "MUST ARRIVE BY" date. If meeting your request requires additional charges for rush processing and/or expedited delivery, we will let you know before work begins. We accept credit cards and personal checks. You do not need to pay until we are ready to start printing, but you must check out (with or without payment) for us to see your order and start processing images. Will you color-correct and prepare gallery wrap sides for my image? Can you do custom mountings and print on other media? If you don't see what you want on this site, please contact us. For example, we will purchase special papers for your order and make MightyCore cutouts. We have discounts for new customers, multiple prints, reprints, and pros. Contact us. We will answer the phone weekdays 10-4 eastern time.